In 1928, when the Boy Scouts of America traveled across the USA placing cement Lincoln Highway markers on the Lincoln Highway routes, they probably never dreamed of the profound positive impact those markers, their efforts and the Lincoln Highway would have on so many people through the generations. Now, YOU have an historic opportunity to help purchase signs to mark the Lincoln Highway. And, it will be in time to mark Indiana’s Bicentennial Celebration in 2016! 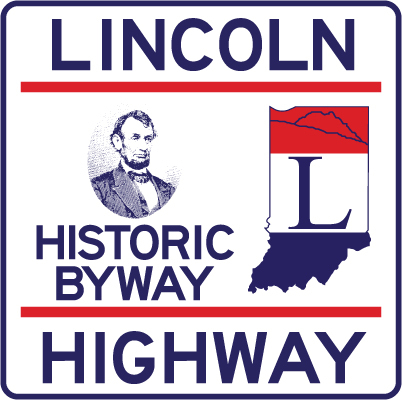 We need to work fast to get this accomplished. . . .
Now, we need your help to provide funds for the INLHA to purchase 170 BYWAY signs to be placed along Indiana’s Lincoln Highway routes. These new INDOT-approved BYWAY signs will be strategically placed on the LH in order to help direct those who are visiting. Each BYWAY sign with directional arrow costs $70. Will you consider purchasing one, two or more of these LH BYWAY signs? Our goal is to purchase $12,000 worth of these BYWAY signs. You can also donate online at our home page using the PayPal Donate button. Just include the requested information in the PayPal comments section. If you have questions, contact Jeff Blair at jeffblair87@gmail.com . Thank you for your consideration of this request. Please note that the date to return your INLHA BYWAY Sign Donation Form is December 31, 2015.